Just when we thought that it couldn’t get any colder in the valley, it just did. The cold weather that has been heading down though Europe hit mainland Spain and the Balearic Islands with a degree of commitment today, and when we ventured out this morning, there was more than just a nip in the air: it was downright cold. Grey clouds started to build over the mountains, and this morning seemed like as good a day as any to start cooking comfort food. 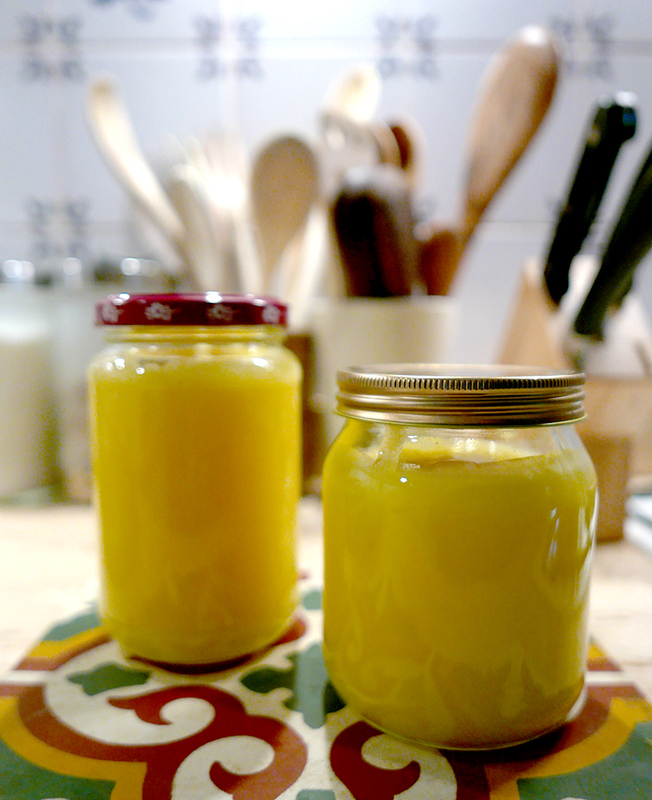 So, chicken and chorizo soup simmering away, I thought I’d have a go at making lemon curd, as we have such a plentiful supply of fruit right now. This recipe has been adapted to allow for the size of fruit we have here. 3 large lemons (or 4 small ones! ), unwaxed and washed. First, prepare two jam jars. These need to be able to hold around 250g each, so average jam jars will do. These need to be sterilised, so wash them thoroughly in very hot, soapy water or in the dishwasher on a hot wash. Then place them on a baking tray ready to put them in the oven. Pre heat the oven to 160 degrees and while the oven is heating up, start to make the curd. Grate the zest of all 3 lemons into a heat-resistant bowl, then juice the lemons and add the juice to the bowl. Cube the butter and add this, and the sugar to the bowl with the lemon juice and zest. Put the 3 eggs and the 4th egg yolk in a separate bowl and lightly whisk them. At this point, place the baking tray with the jam jars and lids into the oven and leave them there for a good 15 minutes while you cook the curd. You need to make sure the jars are heated in the oven for at least 15 minutes, so allow yourself plenty of time. Now, place the bowl containing the lemon zest, juice, sugar and butter over a pan of gently simmering water - do not let the bottom of the bowl touch the water. Gently stir the mixture until the butter and sugar has dissolved. Then add the whisked eggs and whisk the whole mix until it is all combined. You need to cook the mix for around 15 minutes now, and I stir pretty constantly for those 15 minutes. After about 10-12 minutes, you will notice that the mix will start to thicken and the consistency wants to be thick enough to coat the back of a spoon. At this stage, remove the jam jars from the oven and once the lemon curd is thick enough, ladle the mix into the two jam jars. Fill each jar up to within 1cm of the top and then screw on the lid. Allow them to cool before storing in a larder or cool cupboard. There you have some delicious lemon curd, ready to spread on croissants, toast or use to create a lemon meringue pie or some other delicious meringue creation! Just as we photographed the finished results, the snow flakes started to fall. Snow is forecast over the Sierra Nevada for the next 3 days, so it will be very interesting to see if any settles down here. The ayuntamiento has been out salting the local roads, so they must be expecting some tricky travel conditions. We are stocked up with provisions, and don’t need to go out for a while, so the fire’s lit, the kettle has boiled and we can just sit back and let the weather do its worst!